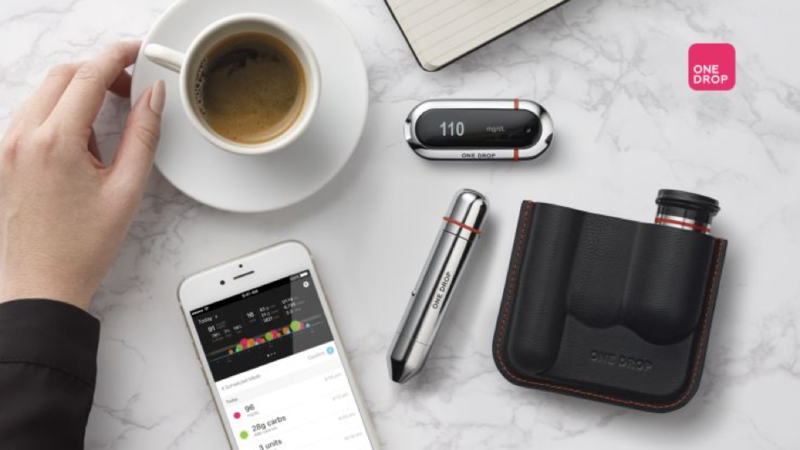 One Drop recently announced FDA clearance (US) and CE Mark approval (EU) of its Bluetooth-enabled Chrome Blood Glucose Meter, along with the launch of its Premium service: offering unlimited test strips and coaching for an impressive $39.95 per month or less without a prescription and without insurance (coaching is English-only so far). 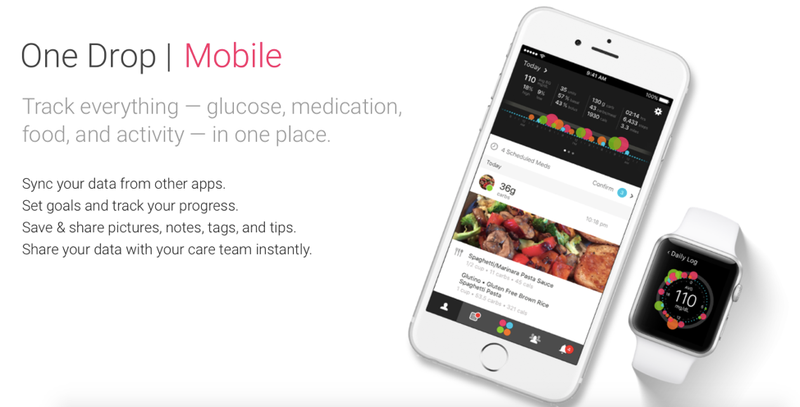 The new diabetes management “solution,” as One Drop calls it, was started by Jeff Dachis, co-founder of the digital marketing agency Razorfish, and includes One Drop’s free diabetes tracking app (available on Apple iOS and Android), as well as the newly cleared meter and Premium Service. Read on for more details! 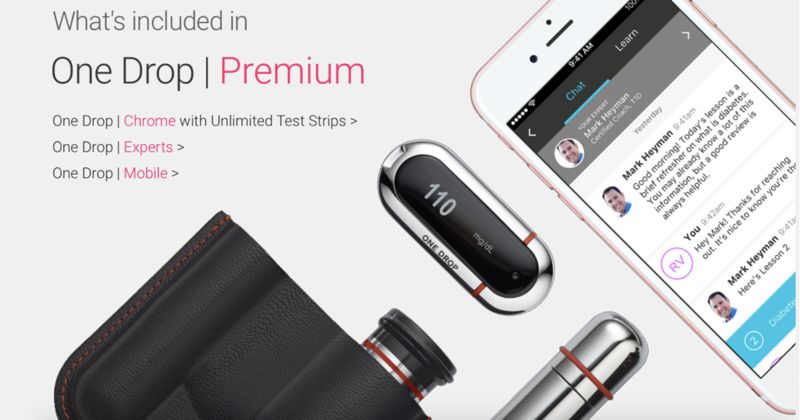 One Drop’s Premium service will offer users unlimited test strips and 24/7 in-app Certified Diabetes Educator support for $39.95 per month on a month-by-month basis, or $33.33 per month with a prepaid 12-month strips subscription. One Drop Premium is “direct to consumer,” meaning strips are paid for with a credit card (or FSA card) and without insurance. This model is actually less expensive for many users than currently available strips, since insurance copays in the US are often $50 or more, even with great insurance. New strips are automatically ordered in the app and delivered straight to a user’s door – no prescriptions needed. One Drop Premium offers diabetes coaching led by educators Dr. Mark Heyman and Rachel Head, and delivered entirely through chat in the One Drop app. This infrastructure will offer users a nine-week, in-app educational program and an on-call chat interface for 24/7 diabetes coaching support. Unlimited test strips for a reasonable price – plus low-hassle ordering and in-app support – will be meaningful for anyone with diabetes struggling to get strips or access to ongoing care in the current system. The One Drop Chrome meter is about the size of a thumb drive, with a black-and-white backlit screen and a single control button. It doesn’t have a lot of frills, since the One Drop app includes all the analysis features. The chrome-encased meter comes with the lancing device in a “vegan leather” carrying case and can be ordered in the app or online via One Drop’s website or the Apple Store. The new Chrome meter ranges from $79.95, if purchased with at least one month’s supply of test strips, to $99.95, if purchased on its own. In terms of accuracy, the Chrome is very solid, with 99% of BGM measurements falling within 15% of the “true” reference value, and 93% falling within 10% of the “true” reference value. That means for a meter reading of 100 mg/dl, the result will be within 10 mg/dl of the “true” value about 93% of the time. The Chrome BGM sends glucose values via Bluetooth to the free One Drop mobile app (available both on Apple iOS and Android). The One Drop mobile app is offered in English, Spanish, Chinese, and Arabic (both mg/dl and mmol/l), though the Premium coaching features are available in English only for now. In addition to tracking blood glucose values, users can track medication, food, and physical activity, and can automatically integrate data from other diabetes and fitness devices using Apple’s Health Kit. Similar functionality is expected for Android devices in 2017. The One Drop app also has a news feed sharing articles and tips, as well as a community stream anonymously sharing other users’ logged data, allowing people to see how others are doing. One Drop is one of the only diabetes apps to include an Apple Watch companion, making it easier to log data on the go. The free app so far has over 120,000 users in an impressive 195 countries.